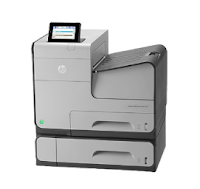 A printing revolution for your company. Produce color documents up to twice the speed and half the cost per page of color lasers. Designed with advanced security and full management, this company's printer is made to last. Print / Copy Speed: up to 44 ppm Black & Color, First Page Out: 10 sec. Resolution: Print: black up to 1200 x 1200 dpi; Color up to 2400 x 1200 dpi. Processor: 796 Mhz; Memory: 1280 MB. Interface: 2 Hi-Speed ​​USB 2.0 Host, Hi-Speed ​​USB 2.0 Device, Gigabit Ethernet 10/100 / 1000T network, Hardware. Pocket Integration, 2 Internal USB Host. RMPV: 1,500 - 5,000 pages; Monthly Duty Cycle: up to 75,000 pages. Languang: HP PCL 6, HP PCL 5c, HP postscript level 3 emulation, native PDF printing (v 1.4). Support: Windows 8, 7, XP 32-Bit, Vista, Server 2003/2008/2012, Linux, Mac OS X v10.6 or higher. Additional Feature: ePrint, AirPrint, duplex ready, 320GB HDD.